There are 3 big decisions when planning and preparing to go full-time in your RV. Regardless of where you plan to go and what amazing adventures you will likely have, you will have to setup these 3 things to make the RV life your dreaming of, come to fruition! Even if you travel full time and live in your RV, you will still need to pick a state that will be your domicile.Think about it as your legal state of residence. This is a requirement by law and doing so will allow you to take care of all your personal business while on the road. Choosing your home base is a big decision! Many of the other legal requirements will be based off of this decision, so travelers should take their time, do their research and choose wisely. Almost everything we do requires a home address. Not a Post Office Box, but a real address you are legally able to call your home base. Things like your driver’s license, credit cards, insurance and voter registration will all require a permanent home address, even if you choose to receive your documents online! For ordinary citizens, their permanent address is the place where they live. Their home. For full-time travelers that will be a state they choose for various reasons and the address associated with that state where they can have mail sent. A residence is where someone lives and has a fixed home. A domicile is where you intend to live and set up a permanent home. These 3 states are the top choices among travelers for several reasons including the benefits they offer to full time travelers, and the ease of establishing the domicile. Other considerations might include things like: sales tax, income taxes, vehicle registration, insurance premiums, & homeschooling laws. Knowing exactly what you want and need from your home base is a great place to start your search. Try jotting down a short list of benefits you feel are your ‘Needs & Wants’. Seeing it on paper can help organize your thoughts and make your research flow smoothly from one state to the next! Different states have different requirements you will need to meet to prove your domicile in one and end your domicile in another. Depending on your personal situations, choosing one state over another will prove to be a better choice for some. It’s important to note, choosing a domicile is not a cookie cutter type of thing, where you just choose one state because your friend chose that one. You need to make sure the state will work best for you! And unfortunately, you’ll have to do the leg work in finding the benefits of each state and decide which one is best for you. Grab your computer or tablet and start researching! 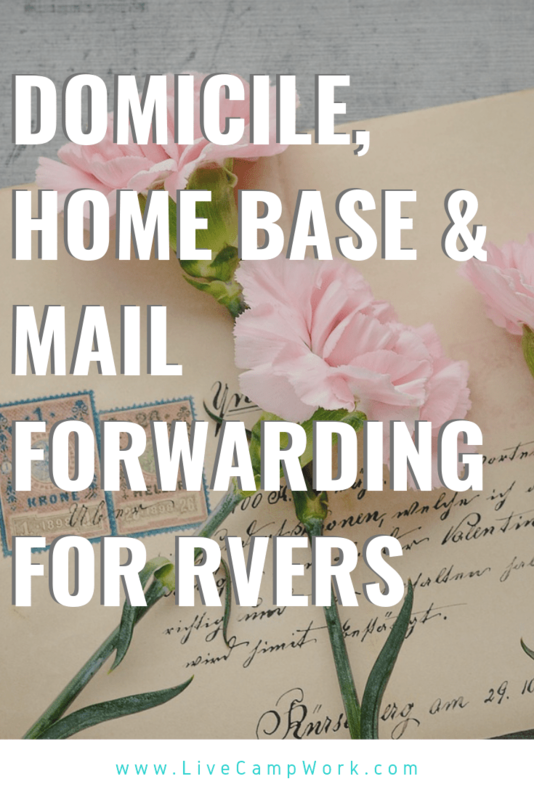 My Go Full-Time Guide Planner & Workbook provides a chart for comparing domicile and mail forwarding choices. The full workbook is currently available on Amazon and includes additional information for those who are still in the planning stages but you can grab it for FREE by joining my VIP List below. So, How do full-time travelers get their mail if they have no home address? Once you hit the road, or hopefully sometime before, you’ll realize you actually still need a home base to receive mail. Luckily there are many options for RV travelers who need to get their mail on the road. While it isn’t actually as simple as receiving mail at your sticks and bricks home, it’s not difficult to get everything setup! That’s it! They’ll receive you mail and hold it for up to 30 days. Your name will need to match the name on the package, and make sure you verify the carrier can deliver to the post office, because I did run in to a situation with Amazon.com where only the items that did not ship out through UPS were delivered. The others I had to go pick up form the UPS center… not fun on a Friday afternoon before the twin’s birthday! Having a friend or family member in a state where establishing your domicile makes sense might be a great option for some travelers! Maybe it makes sense for you and your personal situation. If you have a person you trust or that can be trusted with your legal affairs, such as state and federal documents, vehicle tags & registrations, renewals, healthcare documents, and more; then legally moving in with your friend or relative will save you the time of setting up a mail forwarding service, at least temporarily. It is suggested that before you make such an arrangement that you take the time to decide what the protocol should be for handling your mail. Don’t assume these things can be left unsaid. Setting the expectations on receiving, storing, sending and trashing your mail will make the arrangement less stressful. Having a conversation at the beginning of the arrangement so you know what to expect and they know up front what they’re signing up for, will make sure you don’t have to ‘move out’ sooner than expected! Do you have any family or friends in your new home state? Would they be willing to receive and send your mail while you travel? What do you want them to do with your mail once it arrives? Will you provide a storage container to store your mail until it is sent? Are you concerned about privacy? Should they open any mail? What should they trash if anything? How often should they send your mail? Should they wait for you to ask for the mail to be sent? Or send on specific date? Many RVers use Escapees for their mail forwarding service and to establish domicile. Escapees is a great service and RV community, that comes highly recommended by the masses! They offer services in multiple states for RVers who wish to take advantage of the tax benefits or income taxes of the most RV friendly destination in the US. Although Escapees is the popular choice, there are many mail forwarding services to choose from. I personally use a service out of Florida called American Home Base-which I think is an awesome mail solution. I’ve always been pleased with their services and customer support. After signing up for service, you will be asked to complete Form1583 so they are able to legally act as your mail servicer. The form must also be notarized. Once that’s done, they can receive and forward you mail to any destination you choose. You can call and have your mail sent on the spot or schedule monthly mailings. You’ll get a P.O. Box and a physical address! Depending on what services you need, they can help you setup your domicile as a home base, sort and discard junk mail, read you the sender information over the phone and others. While this option does require some paperwork, dealing with a company for shipments, and a monthly or yearly fee- it’s pretty relaibale and you always have someone who can answer your questions, should they arise. Mail forwarding services have been in business for years, and have a good grasp on the needs and wants of RV travelers. They can usually clarify legal requirements, and help direct you to a resource in the event they can’t. Now all you have to do is decide which option is best for you!